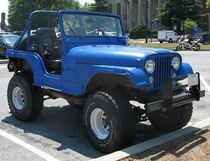 I found my Jeep CJ on a dealer’s lot. The price was right. My best friend had a 1980 CJ5, metallic brown with a tan soft top. After riding with him a few times, I had to have one of these snarling little go-anywhere machines. It wasn’t long before I was on the hunt. I got a good deal because the exhaust was leaking badly and oil was pooling under the engine. I gave it a good looking over and took a chance that I could handle the repairs. After writing the check for $3,500 I took her home. Luck was on my side as the catalytic converter had split open… a cheater pipe to take its place quieted the motor noise down. This was back in the mid-80’s, and modifying the smog stuff was pretty much standard procedure. I removed the smog pump, and plugged off the fittings going into the exhaust manifold. The oil leak turned out to be the valve cover gaskets. Simply torquing the bolts cured the problem. Now I, too, had a reliable, smooth running little go getter. "Come on SNOW", I challenged Mother Nature. I couldn’t wait to see what this little thing could do! My first outing was a fall trip through the woods — about 30 miles from home. My friend and I headed down a logging path that consisted of a set of 2 narrow paths created by tire tracks many years back. We shortly came upon a swampy area. After checking that the 2 narrow paths were solid enough to hold us, we continued across. The wheels slipped off the trail on the passenger side, and down we went. Sunk right up to the edge of the door area. Thank goodness for the high sides of the CJ. We walked back about a half mile to retrieve my friend’s truck that had a winch. Without an anchor point for his truck, it took a good amount of spinning tires while winching to finally drag the CJ back out of the swamp. Thankful that no damage was done, we just rolled on the ground laughing at ourselves for the mess we had created. Many similar exploits followed with that Jeep. It was an amazing little vehicle. There seemed to be no amount of snow that could stop it. With a good set of mud and snow tires on all 4 wheels, I went out in any type of weather — confident that I would get through it without problem. One thing I learned: Short wheelbase vehicles don’t like ice. I was coming toward a stop sign once, and all I did was take my foot off the accelerator. I never even touched the brake. That Jeep spun around on me — a complete 360 degrees in the blink of an eye. As light-footed as they are off road, they can get away from you on ice real quick! In the summer the soft top got folded down as soon as the sun came out. Occasionally I would even fold the windshield down and feel the wind in my face. Taking slow rides through the woods was great this way, as with the top down and the windshield down you are a smaller package and can get through smaller spaces. In the winter when temperatures routinely got below -20 degrees the one shortcoming of my CJ5 became evident. With the soft top on in the winter, it didn’t make much heat. The heater was directed toward the driver, so the lucky person behind the wheel was able to avoid frostbite, however, the side windows remained frost covered and impossible to see through. The passenger was literally left out in the cold. And with no heat aimed their way, it was seldom that you could get anyone to ride with you. One other feature I especially appreciated was the tilt-wheel steering. Being without it would require some serious wiggling to manage getting in and out. By tipping up the steering wheel, it cleared the way for a good sized person like myself to easily slip in and out. That Jeep was one of my first exploits with a serious 4×4 vehicle. Did it live up to my expectations? Absolutely! They’re practically indestructible and a whole lot of fun to drive. Would I buy another? In a minute. Though as an only vehicle, a Jeep is more "rough & ready"… and with age, my tastes when driving a long distance have evolved to "soft and cushy". I only wish the Rubicon was around back then. It’s clear that Jeep is only getting better. And the Jeep is still one tough, go anywhere machine. 1. A winch can get you back on track. 2. For winter adventures, take extra clothing. 3. A good set of mud/snow tires are priceless. 4. Short wheel base means tricky on ice. 5. Being able to STOP is as important as being able to GO. Drive accordingly. Go out and have fun, but stay safe!